The global commodity markets respond to certain issues around the world, any minor issue can get used by traders and investors to justify the fluctuating trading in global pricing, even without there ever being any connection to the true supply and demand - taking that damaging uncertainty out of the markets, especially down at the grassroots level, has been an unsolved dilemma since market trading began in the early British East India Company times. Today's global pricing that's generated by only a small number of traders is a remnant of when trade was able to be controlled to protect the interests of investors backing the exporters / wholesalers and the next buyers in the old world of trade - it commanded control over all the exploited grassroots suppliers, leaving them out of any negotiations - that antiquated control of pricing from the middle to the top in the supply chain is still being used today - that status quo is now being challenged by technology that re-structures the global trade pricing mechanisms so that it begins at the grassroots supplier level, and then moves though the supply chains with value-based markets giving each of the following players a win-win outcome. ComTech Org solves that universal dilemma by digitizing the commercial negotiations between supply and demand along the supply chain with Cloudfunding and Outsourced Selling, starting from a grassroots level - it offers industries like the dairy industry, to move quickly and easily from the analogue world to a digital world to form any size Global Co-Operatives, comprising of grassroots suppliers that operate from autonomous and defendable global trading platforms - Outsourced Selling gives farmers the way to maintain their full product pricing ( local operating costs plus margins ), while having a competitive advantage with a collective bargaining power - collective bargaining in a digital world is where the collective power of the global crowd is able to be organized as something to be reckoned with - this competitive advantage from Outsourced Selling then moves along supply chains ( or can skip stages ) with positive commercial outcomes for all players, through to the end consumers - it has a unique advantage that only digital technology is able to bring to trade dynamics, being able to separate the Selling Price from the Buying Price. A major difference that digital technology brings to the table is that trade can be analyzed in real time and not down the road by weeks or even months - what the platform does is provide feedback to the suppliers all along the supply chain on the demand of the supply in real time - this is where the Price Demand provide the mechanism to ease the pressure on adjusting supply to avoid the dramatic shifts that cause crisis, while still maintaining full Selling Prices for suppliers - that real time analysis is so transparent that grassroots suppliers can see the amount of demand there is at the local consumer level, even with exported products. Commodity markets are mostly played out at the export and import level where the "international flows of assets and liabilities" are needed to be accounted for ( in surplus and deficit ) - that accountability continually swings back and forth for countries trying to get a trading advantage using currencies, subsidies and tariffs, often throwing commodity global pricing and industries into disarray - the main role with globalization has been to use cheap labour in countries so cheaper products replaced the same costlier products made at home - now there's a realization happening around the world that manufacturing jobs moving offshore means less jobs with less wages to afford those cheaper goods anyway - giving big business an opening to focus on exploiting grassroots suppliers to drive local prices down on home soil with many buyers using global prices as leverage. Markets only ever trade a small percentage of commodities ever produced, leaving the remaining volumes to follow the prices traded by the traders in the global markets, prices that are based on what margin they can get at that time, and on the expected demand somewhere in the future, which is definitely not based on all the facts and circumstances involved in producing the products - this 'one size fits all' methodology taken by the markets at the export and import level, is out of step with today's reality when greater production requires greater risk in Capital Investment at the grassroots level - in Cloudfunding as the value-based markets find demand on its way through the domestic Supply Chains to export markets, it finds the optimal demand - at the export level there are more variables taken into account across multi-lateral global markets that can synergize all the demand with a more realistic global pricing by finding a price from the aggregated value-based demand in the export markets by allowing Price Demand to find the true demand, without needing traders. By continuing with global pricing to be set higher up in the supply chain will not provide world food security in the future if the collateral damage is always expected to be absorbed by the suppliers - shifting market mechanics to a value-based supply and using technology that gets real time demand in a free market environment, while giving fair prices to suppliers, who take the most risk in producing the supply, is in everyone's interest. Below is an example of the mechanisms that can form the trading between farmers through to the end consumers, each can operate separately - the Selling Prices are indicative and can be adjusted by Co-Operatives to find the Selling Price that accounts for the various local operating costs and margin ( subject to the broader local industry prices ) - the examples display products already processed by Outsourcing the Selling Prices with the full Selling Price values waiting to be released from escrow, while the Price Demand are ready to find the level of demand between the buyers - hundreds even thousands of deals are processed simultaneously, the buyers set prices that will trigger their bid automatically at the price they are willing to pay ( down to a particular supplier and maximum quantity that can be handled ), buyers take into account their operating costs and sustainability, while still being aware of competition from other buyers. Unlike traditional markets that sell time constrained products and where buyers can have more leverage over suppliers, Cloudfunding is value-based and has no problem shifting leverage over to the grassroots suppliers who can dispose of the products in other ways and still be fully paid, if there's no buyer - in the case where big business ignores the new trading options it leaves the markets wide open for entrepreneurial businesses to take advantage across all types of industries offering products and services. Cloudfunding solves a long standing dilemma of sharing the cost to produce and financing trade more equitably between suppliers and consumers without the incumbents tilting the markets - Cloudfunding disrupts the status quo with "free and neutral trading units of account that are used to monetize global trade and track international flows of supply and demand in supply chains" . . driven and influenced directly by the Global Crowd. The original commodity market mechanisms from those early trading days was designed to protect the big margins for the in-between-ers by exploiting those foreign suppliers - that same trading mechanism is still operating today above big business, which has been able to get away with total disregard to the cost to produce - this mechanism is similar across developed countries and it leaves most of the propping up to governments to subsidize and patch up weaknesses in the supply chains with tax funded schemes that could be spent elsewhere in society - apart from distorting the markets it breaks the first rule of how free markets should operate - shifting that top down trading mechanism down so that it begins at the grassroots suppliers where supply originates is 21st Century's free market challenge to the status quo. The expansion of globalization by the various forces have been able to shift the leverage that the likes of the East India Company had on trading with early suppliers in distanced countries - it gave them the opportunity to establish a market trading system that was able to get the backing from investors to help finance the exploitation of foreign suppliers and bring produce back to Europe and charge enormous margins over their original buying prices - that predatory model of having control over suppliers in foreign countries has over the last decades shifted to the homeland of big business where they have been able to dictate the prices they pay grassroots suppliers on local soil - most of the negotiating pressure on local suppliers has been to unfairly influence local pricing by linking it to global commodity pricing, totally disregarding the varying local production costs. Todays' globalization has left behind millions of grassroots suppliers and sellers including some 500 million smallholder farmers spread across the Pacific, Asia and Sub Saharan Africa who supply 80% of the food to their regions with little say in the prices they get, they are some of the poorest people in the world earning just $2 a day - there's a similar dilemma happening to the majority of farmers in developed countries who also have little control in their product pricing, only the extremes in their standard of living are different along with the debt they carry. Where many industries have fallen to the dominance of large manufacturers and retailers over the last decades, Cloudfunding takes advantage of this unique time in the transition to the digital era to provide the power, scale and backing of the global crowd to support suppliers in controlling their selling prices on a global industrial level. indefinitely - industries with grassroots suppliers have forever been disadvantaged by the lack of price control, and for more than a decade been disadvantaged by digital trading ( HFT, derivative trading etc ) dominated by investors and traders ( rent-seekers ) looking for short term gains that influences global prices - once rent-seeking starts drifting down into supply chains it's difficult to overcome without major change, even well intentioned political intervention with subsidies, tariffs and currencies only distorts free markets. Cloudfunding offers all types of industries and businesses the transition from analogue to digital where economic democracy is shifted to the global crowd, from where direct financial help is distributed to those disadvantaged by the inequality in global commodity pricing brought on by the skewed speculative trading, that has distanced itself from reality and true supply and demand. In many industries sectors shareholder Capital Investment eventually influences local prices and creates a dominance effect in the supply chains ( by demanding ROI ) - the efficiencies in Cloudfunding instead generate a direct financial backing for suppliers ( farmers ) that supports the full Selling Prices - the change comes with the global crowd having the incentive and benefit ( ROI ) for helping the Outsourced Selling process as virtual wholesalers, then benefiting from low Buying Prices as buyers, adding value back into their local economies - GOMTX is an autonomous market economy exchange that synergizes supply and demand with real-time competitive product trading, it's central focus is structured around the democratic consensus of the global crowd and free global trade, bypassing brokers, futures and rent-seeking investors.
' . . Cloudfunding debunks the long held notion that only monetary and fiscal policy can stimulate productivity with the likes of interest rates and quantitative easing - Cloudfunding applies 21st Century technology to offer the neutral and autonomous digital economic platforms to stimulate global productivity across borders, without needing banking systems or government intervention to achieve true free global markets. In the transition to the digital era many industries have been disrupted, convinced that change could never come to their industry - one such industry was advertising and the impact digital technology had on the newspaper industry, that impact has allowed online digital advertising to finance some of the most valuable companies in the world in just a few years - it's that digital advertising value that Cloudfunding disrupts by reengineering how it's generated inside global productivity and how it multiplies that value exponentially - it's then directed towards financing new global productivity along supply chains across all industries involving all types products and services by distributing the value as free working capital to the global crowd, creating DFDCI - Direct Foreign Digital Capital Investment rewrites the rules in how foreign Capital Investment impacts the local economies by directly channeling global value into local regional economies to generate local productivity, without giving away equity or being committed to predatory finance. Implementing FDC and Outsourced Selling only needs to begin in a small region like a town where the grassroots suppliers and local businesses usually collaborate together and feed off each other - once inventory is listed for Outsourced Selling the whole region comes alive within weeks of trading locally - from there the value-adding organically spreads outwards with other industries and cities adding to the new economies of scale. Farmers selling to processors can be as individuals or collaborate with other industry players ( collective bargaining ) by Outsourcing the Selling of their products to secure the high Selling Prices ( set and mandated by industry ) - the option of low Buying Prices are offered to the usual buyers ( processors ) with cascading Buying Prices to draw out competition into the free open market, reflecting true real-time market demand - Price Demand from farmers to processors drop down from the full Selling Price until a buyer takes up the deal, the Buying Price doesn't interfere with the Selling Price, which has already been monetized by the global crowd - this same process operates as easy at the export level as it does at the domestic level. Even if processors want to continue as before and offer their higher prices, it doesn't effect farmers receiving their full Selling Prices - with the farmers outsourcing the selling to the global crowd on the platform, the full Selling Prices can still be released at the time payment is made by the processors, at whatever price they pay - think of outsourced selling in the way manufactured products are outsourced overseas, what Cloudfunding does instead is it outsources the selling process ( not the product ) by incentivizing the global crowd to add their collective effort. The platform provides farmers with real-time control over their products' selling prices, which only needs the quantity to be confirmed at each delivery with a simple mobile notification - on the processors' side the buying price is all that they need to agree with to get access to the product, processors have their own overheads and data on the variables to allow them to set their buying prices before they take delivery of any product, there's no need for long winded agreements to dictate over the farmers - in the event that a farmers' product is not taken up by a processor, the platform tracks the processors' responses and notifies the farmer, once the products quantity is verified the full Selling Price is released and the product disposed of by the farmer. What the platform offers processors and supply chain players is a real-time operating system that allows the overheads and operating costs of any business to meet the market with the buying price they are willing to pay to operate successfully, without harming their suppliers - free markets are when those like processors compete with each other on price and not use suppliers to absorb any operating costs. Technology can now take the ill fitting mechanisms out of local trade by operating on a global scale and absorbing the variations between operating costs and market demand - much of the local trade has no relationship with global pricing that's more based on overall supply into major global markets, that's where the Price Demand bring the balance into local markets. Although global Free Trade is the overall goal it will always be out maneuvered by currency trading that gives countries the advantage of solving their trade surplus or deficit issues - the ". . unit of account used to track international flows of assets and liabilities" that the platform operates with helps to make local markets around the world fit better into the 'one size fits all' mantra by taking out the currency spreads and costs when competing in and from local markets using global pricing. Cloudfunding has challenged commerce and trade on a number of levels but one that has enormous implications is in real-time demand - what Cloudfunding does is it provides a global platform that can give suppliers to retailers the ability to give their customers a way to respond in real-time with the price they are willing to pay, real-time demand on a global level - a Global Price Index provides the transparency and trends in productivity down to regional locations for keeping track in real-time. 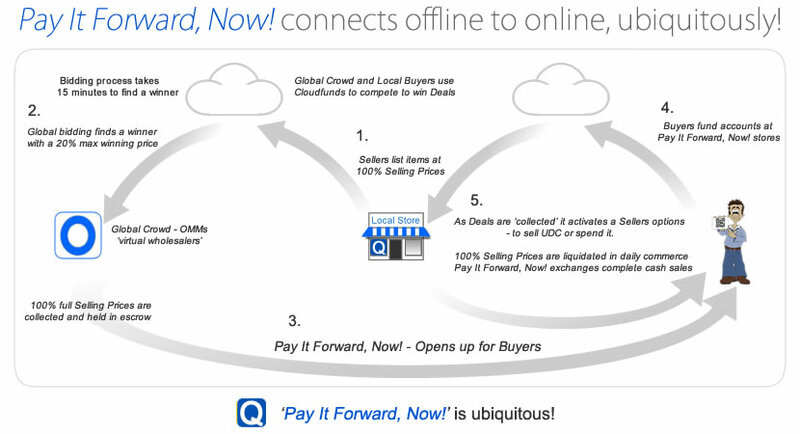 Cloudfunding is structured so the 'sell high buy low' is adopted all the way along the Supply Chain to benefit the end consumers - Cloudfunding works just as effectively from the retail end of supply chains if middle players are slow to adopt - with retailers, if they aren't able to buy at low Buying Prices from their suppliers, they can still list products at full Selling Prices ( GPI - Global Price Index ) for Outsourced Selling - retailers gain the benefit with greater demand by passing on the low Buying Prices ( cascading prices optional ) to their local consumers, denying middle players the price benefits and easing pressure on farmer prices - for small businesses to supermarkets Price Demand is a simple adoption in selling directly to consumers to generate demand. The platform can handle millions of litres or millions of kilograms, whatever volume is produced, as soon as product is able to be quantified ( at pickup time ) the payment by the processor is / can be released immediately, regardless if the product is set for local or export markets - the whole Australian annual milk production of 10 plus billion litres is relatively small in data processing and can be processed by the platform in a day or two, so volume isn't an issue. Traditional markets operate with an elastic type response to market conditions that create the boom and bust, they are designed to gain leverage and extract profit, and this leaves the correlation between commodity market prices and supply and demand in a dysfunctional state - Cloudfunding disrupts that old British East India Company methodology by getting real-time demand responses all the way from the end consumers, even in another country - Cloudfunding has real-time demand as one of its core attributes that can give feedback to the supply side even before the demand side is aware of the market trends - supply can respond by generating demand with cascading Buying Prices or lowering the supply into the location - buying prices are always the deciding factor in supply and demand. A key to accessing global markets is adapting to local costs and living standards - Cloudfunding's architecture is designed to overcome the vast variations in value between economies - the platform uses a global trading currency that's able to be compared to all the global currencies in real-time - whenever a supplier lists products or services in one country a buyer in another country is able to get the value compared in their local currency - the Cloudfunding ecosystem has solved a fundamental problem with global trading by operating all the trading with the neutral global trading currency, which's capable of comparing values between local currencies without any spreads or fees to dilute the trade value for seller or buyer. In domestic markets that are synced to fluctuating global market prices, there's little difference between coffee growers in Ethiopia where there has never been any real advancement with trader dominated prices, and industries like dairy in Australia that have the privilege of borrowing to build up productivity but are still dominated by traders up the supply chain that are mostly protected from global prices by being able to limit receiving supply, and so passes on much of adjustment down to the farmers. 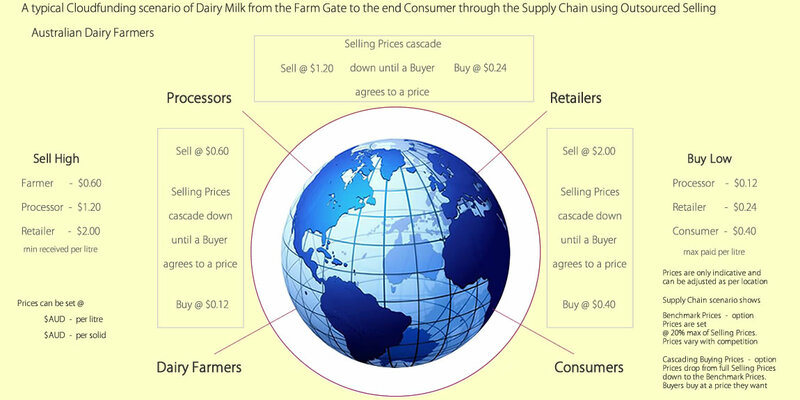 Typically, an industry like Dairy has a top down dominance where the farm gate prices are subject to global pricing that each player uses to set pricing - what Cloudfunding does is it maintains profitable industry prices regardless of the fluctuations, if the global market price increases over the local industry's parity price ( local industry production costs plus profit margin ), then local prices move up immediately in real-time so farmers gain the benefit. The end consumer is where the benefit needs to reach and the Dairy Industry can do that all the way from the farm gate with Cloudfunding and Outsourced Selling - a typical example below of the low Buying Prices for the consumer still provides good margins for the end retailer. In the case where exports involve set prices that need to abide by, it still means that dairy farmers get the full Outsourced Selling prices, if buyers are obliged to pay the export market prices they still do so - the export market payments are paid as normal ( no payments are paid to or held by ComTech Org ), this allows the full Selling Prices to be released directly to the farmers - whenever higher export market prices are relevant then those prices are adopted by the Outsourced Selling process so the farmers receive whichever is the higher. In any industry the operating costs are varied and what Cloudfunding provides is the platform for suppliers to intertwine to gain from each others products and services to keep operating costs down - the low buying costs are not just limited to products like stock feed, diesel, veterinary, electricity, insurances to run the operations but it spreads down to local businesses selling everyday items like food, clothing, school fees etc. The buying power from lower buying prices, whether it's in the operating costs or in the cost of living, the gain is an advantage and can lower the rural debt that's so prevalent in the farming industries in the developed economies - the capital outlay in most cases necessary to gain productivity, is no longer in sync with the risk - suppliers now have the advantage of Cloudfunding to gain control of costs by using a universal co-operative with the neutral backing of the global crowd, which has the collective bargaining power to maintain profitability. Even if there's resistance by processors, the farmers can still gain the full farmgate Selling Price, and so deny the processor the lower Buying Prices, although the processor's shareholders may see it differently. The difficulty of accessing export markets is that most competing countries either have substantial tax relief to subsidize their local industries, which still gives extra leverage when negotiating prices for export trade - Cloudfunding gives the exporting country the room to find the accepted Buying Price in the importing country, without hindering the full Selling Prices back in the producing industries - even the importing country is not hindered when determining tariff revenues, as the full Selling Price is the value applied ( re: U.S. Customs ) - if there're producers in the importing countries they can counter the importers by using Cloudfunding to even out competition. Cloudfunding has a significant advantage over basic market dynamics that still use analogue practices - Cloudfunding can be accessed more easily by the local end customers in export markets like in the African, South America and Asian regions with India, China etc, where the majority of the populations have no bank accounts, everyone operates in cash - this advantage means for example, milk produced in the Australian market can be sold all the way down into the Asian market ( or any location ) - where local shop keepers can get the competitive advantage of full Selling Prices while they offer their local customers access to Australian produce at low Buying Prices - all done on the platform using a mobile phone. Cloudfunding reverses the Outsourcing practice commonly used in Globalization to manufacture where cheap labour can be taken advantage of - Outsourced Selling turns that around with Localization by providing a more balanced flow of trade by protecting homeland industries from volatile world markets, while still helping to solve global inequality at both ends of the markets - there is huge difference between being part of the global market to being used by the global market, Cloudfunding eliminates the latter. GOMTX is an economic platform focusing on trade markets using a Global Price Index to track a market's global pricing to ensure Cloudfunding prices are maintained independently at or above market prices - Cloudfunding uses the Global Crowd and a democratic global consensus model to maintain profitable margins for all Sellers, bypassing the old British East India Company model with its incumbent traders. Processors buy directly from the Seller's Trade Xchange. In each stage of the supply chain in every industry there're operating costs that make up the core cost of a product's price, before a profit margin is added to help with further growth or for distribution of wealth - being able to negotiate the lowest price at any stage in the supply chain is seen as good negotiating skills but what scale and globalization has done is given way for predatory trading to emerge and effect supply chains - predatory tactics usually comes with having the financial capacity and scale to overpower suppliers. Cloudfunding provides the suppliers with the financial capacity and scale to hold their ground with fair pricing - when buyers ( even farmers buy from suppliers ) in the supply chain gain the advantage of lower Buying Prices from suppliers, it provides better profit margins to spend on ways to grow productivity, and gain the capacity to access more markets. The structure in the overall market economics in Cloudfunding change the rules of commerce with the full selling prices being monetized by reverse engineering online advertising and redirecting that value to the global crowd where it's used as free working capital to support the productivity in markets and industries - this is the correction in market fairness and social wealth distribution that market forces have no intention of changing. GOMTX brings a new dimension to how digital is used in global commodity markets, instead of using a digital form to display the trading results of individual traders - what GOMTX does is it digitizes the full trading activity, from listing a product to exchanging it for payment in a local region - instead of traders, the trading platform invites the global crowd to act independently as virtual wholesalers ( virtual traders that have the perpetual incentive ) to bid for products, it's this action by the global crowd that's uniquely digital - the movement that the global crowd can now have on the world, is all there to see - GOMTX is able to harness this crowd power and link it with a democratic competitiveness that allows micro payments to directly flow from global economies into the seller's local economy, to fully monetize the trade - the direct payment flow guarantees the full Selling Price for the farmers ( sellers ), and waits to be released from escrow at the exchange of product. The exchange of product validates the trade and effectively the value is drawn into local economies by getting liquidated into the mainstream commerce and into the pockets of the local community - just as the world has come to accept how money can be transferred from an account to another in other countries, GOMTX does it with a neutral trading value ( that's constantly compared with local currency exchange values ) by directly transferring from economy to economy using Cloudfunding - this is digitizing the financial dynamics in trade in a new paradigm, it tracks micro values between economies on a global scale by interlinking all types of industries and productivity, and, combines all the functions needed to complete an exchange of trade down to the seller's location - it streamlines industries by taking out the volatility in the markets and gives Supply and Demand long term equilibrium, a 'win-win' formula. While the Seller's full Selling Price is guaranteed by Outsourced Selling to the global crowd, settings for the Buying Price has two options - the benchmark applied in Cloudfunding of 20% of the Sellers Price is specifically to give a greater buying power and help reduce debt - the GOMTX platform gives Industries and Sellers the option to apply the Benchmark Prices or Price Demand ( e.g ) with listings constantly updated to market indices - the Dairy Industry for example, having cascading Buying Prices that drop down to benchmark prices ( aggregated price can be under benchmark price ) for processors, provides true open market trading - farmers have the option of being able to include all or selection of processors to bid for their product - when the product is released to the market for processors to bid, it can be any time prior to pickup time, just as with the usual practice for pickup times - the main variables being quantity and quality are what processors need to evaluate in their bidding ( end of season variations can be eliminated by adding these variables into the bid price willing to be paid ). Where real-time Demand comes in is in the processors bidding for the product at the farmgate price they are willing to pay, which Outsourced Selling offers processors to buy at much lower prices than the prices typically offered in the markets - the release of product by farmers can be set days before pickup and processors can automatically set the Buying Price they're willing to pay, and from which farmer - each processor knows their operating costs and they know from which farmers they get their preferred product from, they also know the quantity they can handle and need to operate profitably with - what they don't know is what other processors are willing to pay, even though cartels or collusion can come into the market it can also easily be seen from the platform, it doesn't necessarily mean that there's an issue as it doesn't effect the farmer's farmgate price - farmgate prices automatically rise in real-time with Global Dairy Prices whenever it moves above the farmgate price ( set by the industry with variables like higher operating costs in some locations ), moving away from limited predictions set by processors that've typically been used. GOMTX allows Outsourced Selling to challenge markets from both ends - in the case where some milk and dairy product retailers can have control over their suppliers by dictating the price they are willing to pay, and use this advantage so they ( some retailers ) can offer lower prices to their customers - what the platform does for retailers is challenge the end Buying Price for the consumer without interfering with the Buying Price that they ( retailers ) pays the manufacturer / processor / wholesaler - the best option of selling to the end consumer, in this case, would be to use the Benchmark Prices with the more consistent Buying Price, this price can vary ever so slightly depending on the quantity that the retailer buys ( aggregated processing prices ) but will always be at or below the benchmark price - retailers can have product on the shelf listed at the low Buying Prices ready for customers to buy ( buying online while in the store ), or the retailer can release the products online so local buyers can make the purchase and come in for pickup - small retailers ( entrepreneurial businesses ) with limited market share can use Outsourced Selling to be competitive, with not only milk and dairy products but with anything that they stock. All along the Supply Chain, whenever an exchange of product or service is made, the payments are immediately released by a Collection Code - there're no 14, 30 or 90 days waiting for payments in Cloudfunding, so it gives all players the cash flow to get on with business. While Industries like Dairy are globally huge in size, in the digital world size is exponential - where limitations in the physical environment are contained in scale, the digital environment is capable of being almost unlimited, so it will always be able to provide the platform for the physical industries to operate with - bringing together a trading platform, that has greater scale and value than the online advertising environment ( think digital behemoths ) so that Supply and Demand across multiple industries can operate with an equitable balance on a level playing field, is the only way industries will transition into the 21st Century and solve scale in productivity that's sustainable and profitable. The social media element in the digital world can be both rewarding and damaging - crowd power is a unique phenomenon that's been brought to the forefront by the digital age, which in recent years has helped topple governments and is now being seen as a force to be reckoned with - Cloudfunding is built on the social involvement with the global crowd by being at the forefront of driving productivity by giving the incentives that are needed across our unequal world - where products and some industries have seen damage caused by an image or a comment in social media, the scale and architecture that Cloudfunding and Outsourced Selling is designed around uses the global consensus to influence markets, on a much greater scale than what trolls can do - the social marketing effect and impact that Outsourced Selling has on any product or industry, is profoundly greater than all the negative ( false ) social media and all the paid marketing will ever do. Digital still should be simple, and the platform is designed to allow a farmer to organize their expected production in advance up to 30 days by listing what quantity the farm expects to produce, it doesn't matter if the supply falls short as the volume produced is deducted from the listed quantity at each pickup time, if there's a shortfall the farmer has a surplus volume set aside by the platform to take advantage of at the same full prices. Listing a quantity only requires a few minutes to add the volume ( and any variation ) with the full selling price and range of expected dates - the Outsource Selling process does the rest and has the quantity ready to be activated simply using a mobile phone and acknowledging the processors pickup, the processor has already funded their account in anticipation of taking up the supply and payment is immediately released to the farmer. 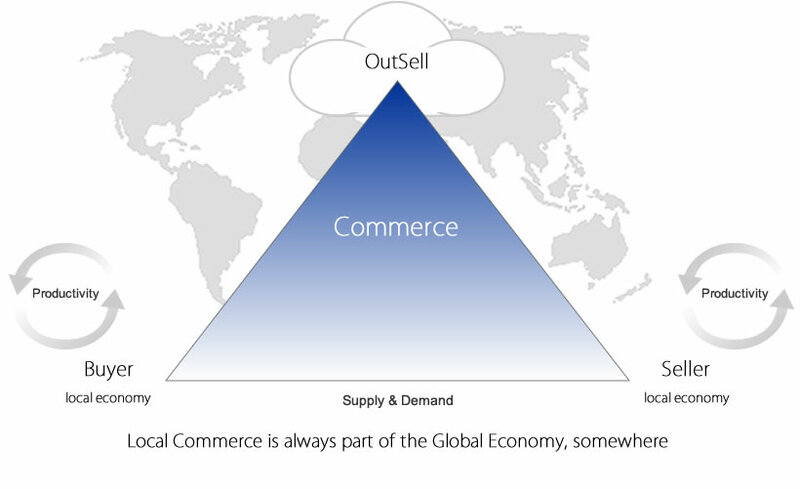 A Global Seller's Trade Xchange is used to list and buy from any country and region, the competitiveness in the industry and market comes with how a farmer or any seller takes advantage of the broad number of other suppliers of products and services also listing on the platform that are part of their operating costs. Cloudfunding has several abilities that can provide broad benefits for any type of seller, and the dairy farmers is no different, as sellers there is the Digital Sales Division that is designed to help sellers Outsource the Selling of their own products - it's like a self generating marketing and sales system that is securely validated against true productivity. With Cloudfunding for the seller, there's not only the selling of their own produce, it's also all the supplies and operating costs that help with their productivity - costs such as fuel, feed, fertilizers, insurances, food for the family, all these types of locally purchased items can be sold by other local suppliers at the low Buying Prices while they gain the benefit of the full Selling Prices. The change of how markets work, comes with the change in how influence and value cross borders to stimulate local economies by the actions of local sellers using free Direct Foreign Digital Capital Investment - Cloudfunding does the rest. The Dairy and General Farming Industry usually has long term and often family employed to operate the business, but sometimes freelance workers - short term employees are required, most can be backpackers, immigrants and other local people that fall into the casual work bracket. The type of work is usually daily and seasonal and most wages are based on the quantity of product that's collected or it can be a fixed wage - and it can often be a family business that still needs to have wages to support a family's lifestyle. Where there's volatile market pricing effecting the income of a business and the flow-on wages, Cloudfunding provides Outsourced Selling to sell the produce at fair Selling Prices but it also follows up with the advantage of having wage security with Wage Shift. The ongoing operational costs are what is often the biggest issue that can't be avoided when the global markets fluctuate pricing, so Outsourced Selling is there to met those challenges, and this is where a major concern in many countries is with Rural Debt. Cloudfunding offers a service that secures better wages for the employees workers and better ROI for the employee boss - it gives a better level of payment security for the workers and an advantage for the bosses. The Short Term Jobs service is part of the overall Wage Shift that can be applied by the worker or the boss to gain the benefit of Outsourced Selling. Outsourced Selling of Short term and Long term employment wages both have an added value on the often low wages that get paid in the industries - the benefit for the boss is the low Buying Price that they pay to release the worker's wages. The payments made by the boss to release the wage payments can be directly taken from the Business account that holds the revenue from products and services sold using Outsourced Selling or the payment can be made at a local business that has used Outsourced Selling and is looking to liquidate their sales revenue - either way the flow of revenue continues to stimulate the local economy. Wages are secured for the workers from the time it's released into their account, and the for the boss, all the normal taxes and benefits are paid separately and clearly are detailed in the worker's account. Modern commodity trading has stayed in the old world thinking that it's good to be greedy, by looking more at quick turn around profits at the hinge point in the Supply Chain value, rather than having a fair balance of value along the chain - Outsourced Selling only operates with actual products and services that are delivered in real-time, not in speculative futures trading. Cloudfunding doesn't rely on an over supply or under supply of commodities to change prices, it relies only on actual productivity and consumption - there will always be a buyer taking advantage of low prices and Outsourced Selling avoids the 'race to the bottom' discounting scenario - the world is at an important point in solving the ample supply of food for the world, commodity traders looking after their own interests is old world thinking. Further along the Supply Chain with Milk Processors the same effect can be gained from Outsourced Selling by having supplies available to retail stores at low Buying Prices ready for the local Buyers - generating real-time demand. From the farmer to the end consumer Outsourced Selling can be applied to give each Seller the full Selling Prices while at the same time each Buyer along the Supply Chain including the local Buyers is able to purchase at the low Buying Prices. All the functions between the Buyers and Sellers are processed securely online with payments secured in escrow at all times with the release controlled by the two parties exchanging codes to release payments at the exchange of product. Cloudfunding offers real-time payments, avoiding any use of credit terms and delay of payments. Localization provides the environment to protect local industries and businesses from competition and volatile global market pricing. Both Sellers and Buyers inside the Supply Chain can gain from all types of other products and services that can be part of their operating costs like fuel, energy even insurance. becomes the obvious answer to ordering smaller quantities that can be repeated far quicker than needing to rely on off-shore manufacturing, if reliable local supplies can be delivered in smaller quantities, then repeat orders can be met with more frequency. Maybe the suppliers use Outsourced Selling as part of their business strategy, which can start the chain reaction along to the consumer, who takes advantage of the real-time. Not needing to wait for customers to find the products and services and go through the sales pitch and time consuming wait to clear the shelves, even needing to start discounting the last of the items is money and time lost. Real-time demand is keyed into the Outsourced Selling process as soon as the products and services are listed by the Sellers, once local Buyers know of the pending releases they are able to set their Notification alert settings to do the buying for them. Local Buyers can participate in the bidding process to get in early and they can also pre set the amount that they are willing to pay for the item when the Price Demand are set by the Seller or lets the Buyer know when it's available to buy at the LA Deal Price. The local Buyers only need to have funds in their QwickPay accounts to use the settings to buy immediately products and services are released, saving all the effort of waiting on the phone. ComTech is an Industry of Commerce and Technology, and it encompasses all the services associated with Commerce, this includes the founding of the new medium of exchange that takes over the role of banks in Commerce with the free digital financing of both business and consumer, regardless of where they sit along the Supply Chain, the technology includes eliminating any need for incumbents in the exchange process of final payment between the Buyers and Sellers. The ComTech Platform eliminates the incumbents operating in the Old Economy methods that relied upon the extraction of value from the Productivity Supply Chains, replacing it with New Economy morals that offer societies the freedom of a Cashless World. The ComTech Industry ecosystem is evolving into a Global Chamber of Economies entity, with a mandate to secure the individual Ownership of all digital cash for all global citizens, it's a self sustainable NGO system committed to monitoring all activity from a neutral position - at no time does ComTech or its associated group hold or accept physical monies on behalf of the global players. Every Seller using Outsourced Selling now has a better than Competitive Advantage in their local trading zone. - it can be applied with anything locally produced, manufactured or retailed along the Supply Chain. - it can give Sellers unlimited predictable and guaranteed sales, all for free. 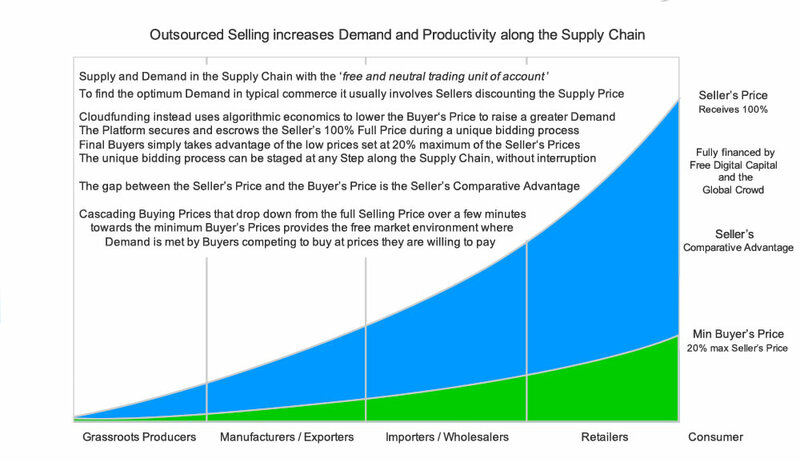 Outsourced Selling is pro-active, it 'pushes' commerce to achieve sales. Pressure by predatory trade in the Supply Chains placing the likes of food suppliers in jeopardy, is countered.
. . . if it's to achieve major economic results, at the least possible cost. - it adds the incentives for the Global Crowd to be involved in expanding the decentralized structure. Sellers now sell at full profit, giving buyers benefit of discounts - how long could a Seller's competitors survive?